Through a weird confluence of events we ended up at the in-laws overnight this past Saturday. 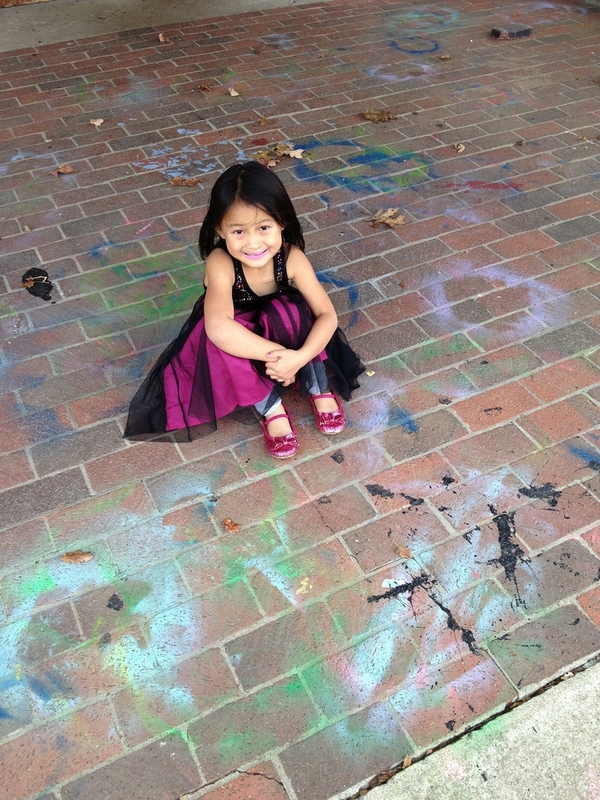 That’s always so much fun for Bug– she loves her LiLi and YeYe. 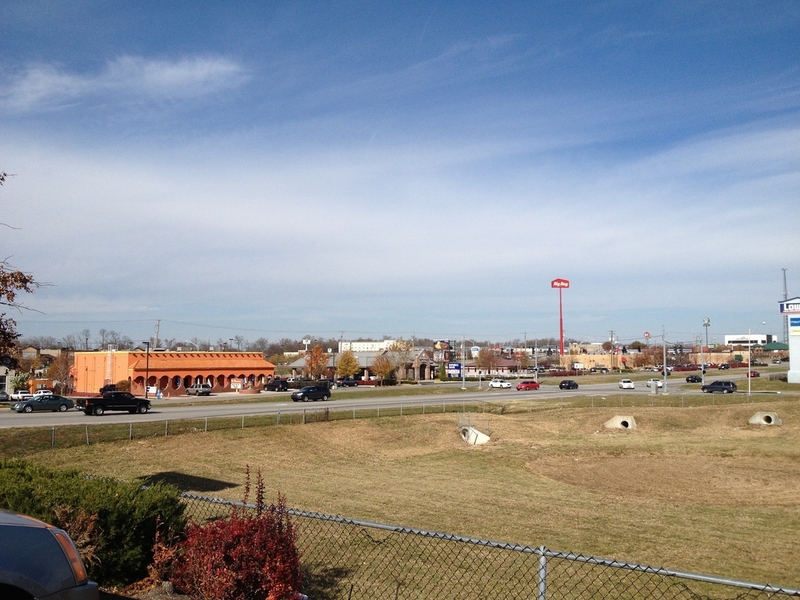 Even though it’s November it was beautiful this weekend– sunny and low 70s. 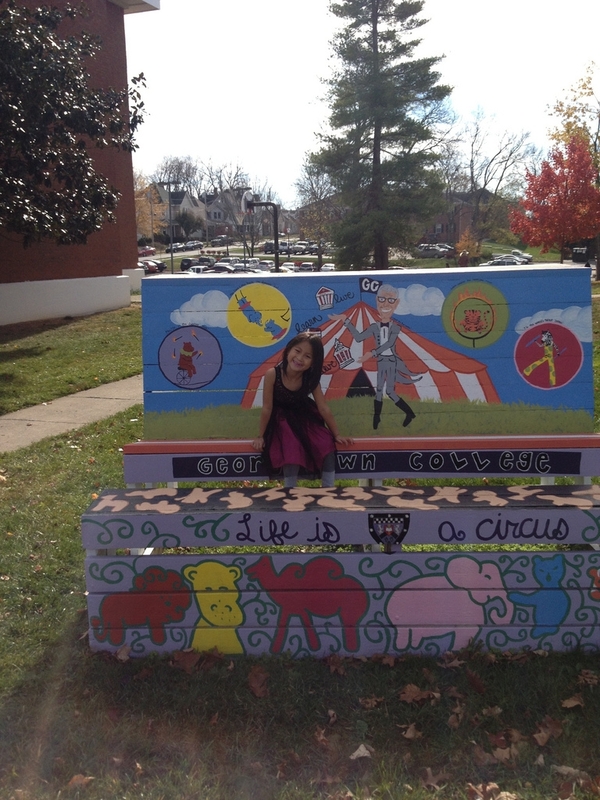 LiLi and YeYe live only about 20 minutes from G’s any my undergraduate alma mater, Georgetown College. So we cajoled Bug into driving over Sunday and seeing where Mommy and Daddy met. 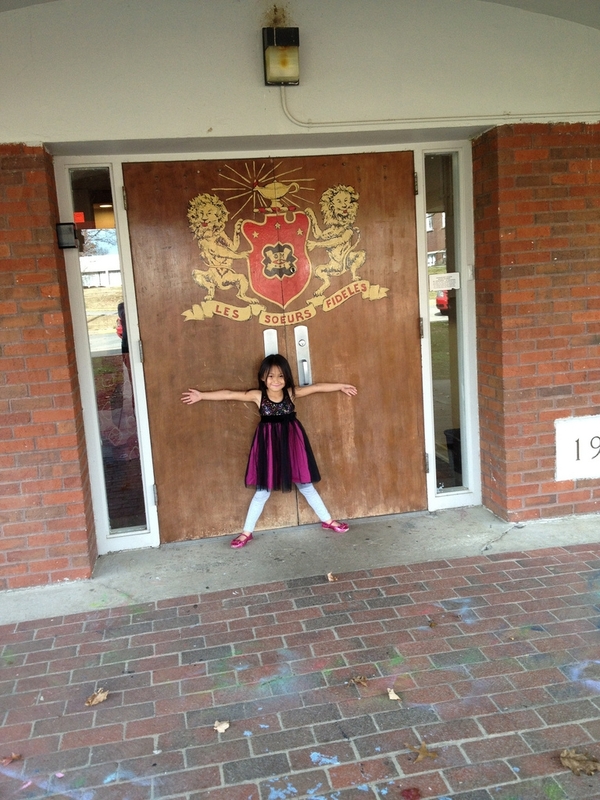 We started out by showing Bug the dorm where I lived my freshman and sophomore years, Knight Hall. My mom lived there too. From there we parked in Giddings Circle and walked into the heart of campus. 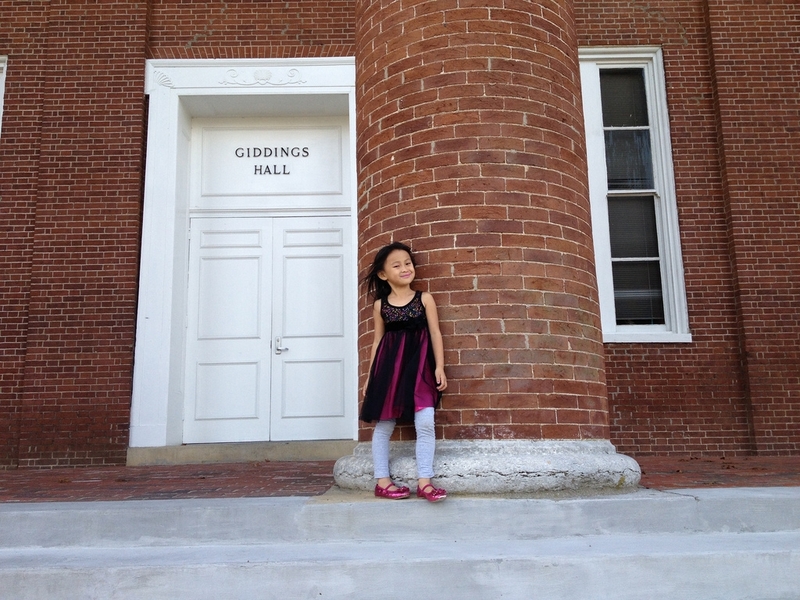 Here’s Bug on the steps of Giddings Hall, the historic administration building with the super-cool brick columns. 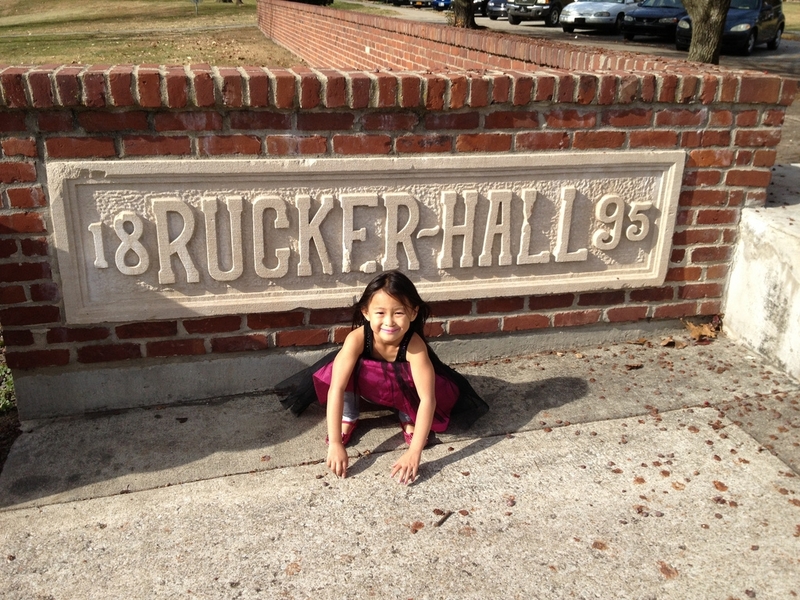 And here’s one of Bug in front of the 1895 cornerstone of Rucker Hall, where my mom’s sister lived. My sorority house now sits where Rucker sat. We walked around south campus, and showed Bug where G lived his freshman year and where my brother lived his last three years, Collier Hall. We swung around and showed her the houses of my mom and dad’s “clubs,” even though those houses didn’t exist when they went to G-town. 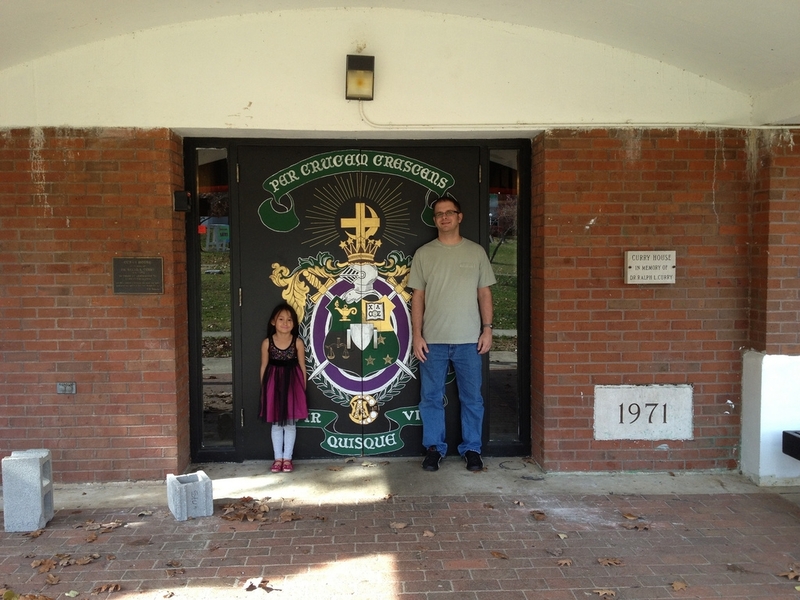 We stopped at G’s fraternity house, the Lambda Chi Alpha house, and got another pic there. We went back to the heart of campus, walked Bug through the student center, and then stopped for a pic looking back out toward the great big library that G and I only wish had been there when we were students. It was kind of sad being at Georgetown today. Georgetown is having financial problems, and the turmoil led to the (forced) resignation of its long-time president, who was inaugurated when I was a sophomore. I also can’t imagine wanting Bug to ever attend Georgetown, either. It’s way too “white,” for lack of a better word, and will likely be too socially conservative for her. It was the perfect place at the perfect time for both G and me, but I doubt it would be for Bug. It sure was nice seeing it and showing it to Bug on a beautiful fall day, though. We finished out the day at Steak and Shake, which like so much else, wasn’t there when we went to school in G-town. In fact, almost none of the interstate sprawl in this pic was there. Lots of changes! 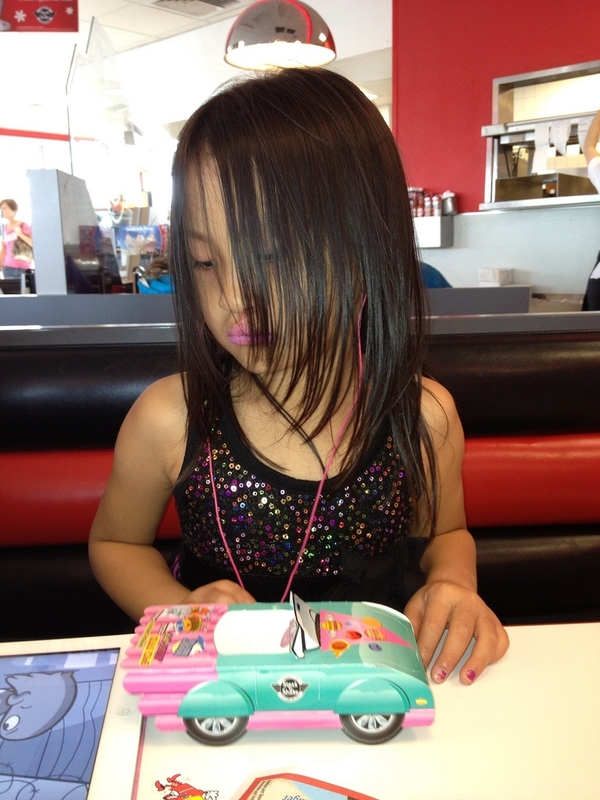 Here’s madame at Steak and Shake– her first visit to the hallowed institution! We had lots of fun today. These kinds of memories are priceless! This entry was posted in Marriage, Mommyhood, Travel. Bookmark the permalink.